I need to get my boots and shovel out. Bee venom...really? With the rapidly diminishing bee population, which will affect our environment beyond words (birds and bees...anyone), I am rather disgusted that Camilla would use the product of bees for something as superficial as beauty, something that is a lost cause for her anyway. And I am rather appalled that Charles would even allow it. Knowing how fond he is of gardening and the environment, he must realise the grave consequences of bees dying with the thousands. Taking away the venom, one of the bee's natural ways to protect itself, is just environmentally unsound. The comments are hilariously horrible. When will the palace and the DM realise that this woman is NOT liked? They say bee venom, I say plastic surgery. She may be rapidly approaching her 66th birthday, but when the Duchess of Cornwall stepped out at the investiture of the new King of the Netherlands earlier this week, the world was in awe of her glamorous new look. The secret behind Camilla's fresh-faced glow is bee venom, which she slathers across her skin to maintain a youthful visage. And it seems that women are rushing to emulate her look because sales of bee venom have soared since photographs of her youthful looks were released. The Duchess of Cornwall today made an appearance at the Badminton Horse Trials to hand out trophies to the winners. Camilla, looking glamorous in a cream shirt dress with pearls at her ears and her hair in a youthful flicked style, looked to be in good spirits as she arrived at the Gloucestershire meet earlier today. Camilla, who has had a lifetime love of equestrian sports, was in attendance in her position of patron of the British Equestrian Federation to present the awards at the end of the jumping portion of the Trials. Her fellow royals had been out in force at the event this week to watch Zara Phillips compete in a number of events. But after making a mistake on the cross country course yesterday, the Queen's eldest granddaughter was forced to retire from remaining events meaning she did not compete in today's showjumping as previously planned. I would style a paper bag and that would be an improvement. If glamour is adultery, ok. The Wrinkly Homewrecking Bloodhound expects peasants to fawn over her glamour. "Stunning" is not an adjective I would use to describe Camilla. The DM is attempting (and succeeding) in winding everyone up. Judging by her smug looks the Duchess Rottweiler believes her own publicity. She has that ugly crooked mouth. Charles must be shoveling money to the DM by the bushel. Disgusting woman. I hope this backfires on the two of them and only increases public dislike for her. Imaginary conversation about how these articles came about. Charles - Camilla what is wrong? Camilla - Just promise the editor at the Daily Mail a Knighthood or fork over some money to the DM. I want to see more articles about ME not HER. (Fawcett comes in), Yes Charles what would you like me to do? Call the Daily Mail (and give them this bank draft) and tell them to write more Camilla stories. Charles - And make her look glamorous and tell the palace staff to red arrow the bad comments oh and get a few people to say I'm entitled to happiness and Diana was a loon. You know what I mean? Charles (exasperated) Better tell them to run it tomorrow Michael. Charles - Good Riddance. COme on Michael you can come with me and watch me sketch. The Duchess of Cornwall is on a roll lately, impressing fashion fans with her elegant wardrobe and dazzling accessories. Today Camilla attended the State Opening of Parliament for the first time alongside her husband Prince Charles, who was attending for the first time in 17 years. The stand-out part of her outfit was the glittering Greville tiara, on loan from the Queen who was left the tiara by her late mother. She reigns supreme and was voted as the most attractive royal woman Of All Time and deservedly so. By an overwhelming vote, readers of the Daily Camilla Mail voted her the Fairest of them all. One person who saw the breathtaking Duchess go transported into Parliament said "My Eyes My Eyes, I had to wear sunglasses to withstand the Beauty and Loveliness of this woman. Diana was merely pretty this woman is a Classic Beauty who dresses perfectly, has silky gorgeous hair and has a timeless beauty about her. All the men there wanted to have her and looked at their plainer wives and sighed. 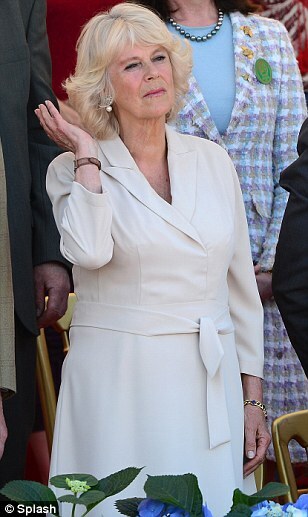 Women envy her so much they have all rushed to the Beauty Parlor to get a copy of the Camilla Hairstyle. Now the DCM can report that there is a grass roots move to oust the Queen so Charles who has so many ideas and little time to get them going can be King and Camilla can dazzle the country as Queen. Look, the Queen is not getting younger and Charles can do so much better. Charles of course was unjustly criticized for his first marriage. Diana of course was a scheming, mad unbalanced woman whom Charles was forced to marry. His mean parents told him NO to Camilla and then Philip drugged him and forced him to go to St. Paul's and Marry Diana. Diana of course had many lovers while Charles only had one and it was a pure love that he had with Camilla who was saddled with a serial cheater who hurt her and she ran to Charles for protection. The UK can rejoice the time of C and C is soon to come. Don't worry Sandy, karma can be a *female dog*. I think you would fit right in with the other DM reporters. That sounds like it belongs in the DM. LOL sandy you are a very good writer as snokitty says you would fit in DM or Hello. Camilla can be a lot of things but stunning and well dressed?